DECEMBER WHAT ARE YOU DOING HERE ALREADY?!? Seriously. I can't. Where did this year even go?!? Although I'm crazy excited for the holidays to be here, I'm also crazy nervous because we are getting married in less than three months. *insert frantic and emotional bride yelps here*. I've have to buckle down on so much this month, so let's get into it! 1. Blog consistently. Tehehehe. No. 2. Do our wedding registry, start figuring out our bridal party gifts, find a place for our rehearsal dinner, start DIY'ing as much as possible. So far so good with all the small details. If you're from Orange County, do you have any suggestions for a place to have our rehearsal dinner? We're super low key. I mean, I wanted to do it at the Olive Garden because I like their salad :D since a few people weren't too keen with those plans though, I have to step it up a bit. Thoughts? 3. Focus on eating as healthy as possible/working out more. 4. Go on more adventures! 5. Get my Christmas posts up. Eh. Not so much, I wanted to post a lot more DIY's before December, but alas I didn't have enough time. They're coming though! 1. Find a place for our rehearsal dinner, continue DIY'ing, send out our invites (OMG), start putting together a playlist. Wedding overload. 2. Workout 3-5 times a week. 3. Spend quality time with friends and family. 4. Relax and enjoy the little things! Alright, let's rock this month!! What are you hoping to accomplish in December? ICANTWAIT ICANTWAIT ICANTWAIT ICANTWAIT ICANTWAIT . i'm so so so excited to see what you guys have put together &to meeeet you in person!! promise im not an old man. Dogs in sweaters kill me - adorable. Not going to lie, Olive Garden for a rehearsal dinner might be the most genius idea ever. I would be SO into that haha!! I had a couple of birthday dinners there in college and they have huge tables ;) Can't wait for all of your Christmas DIYs! So exciting. I was watching Don't tell the bride last night and thinking of so many things for my own wedding (still not engaged yet...!) I will be literally talking non-stop about weddings when it does happen! I definitely am working on balance for the month of December! Ack three months! So many details! Keep lists and you will be sure to capture everything! Less than 3 months! WHOOHOO! ahhh he's so cute in his little sweater!! Good luck getting all that done! My list is so similar! Im trying to get back in the gym for sure. But no I CANNOT believe it is December already! 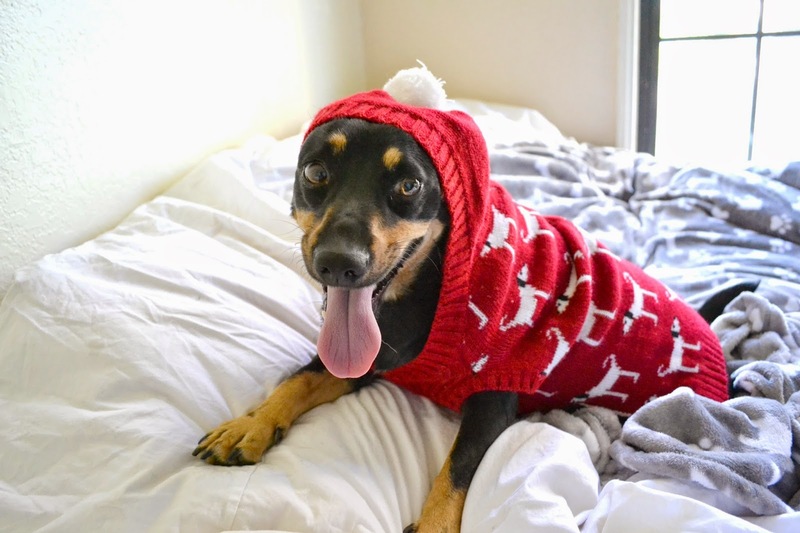 Your dog is in a sweater! ha love it. looks like you did pretty well on your november goals to me! nice goals!! I'm hoping to accomplish a lot actually. Fitness goals, more play time with my daughter, and much more! Your dog is so cute. This year flew by. Good luck with your goals and good luck with your wedding planning. Ahhhhh your pup is so cute!! So exciting! Good luck with all of your wedding planning! With a wedding to plan, I think getting any other goals done is a bonus to be proud of! good luck! This picture is the cutest! Love your pup! Mama's 39 has a back room and great atmosphere. Its in Huntington Beach.